Cristen P. Page, MD, MPH, has been named chair of the department of Family Medicine, effective March 30. Page is a multifaceted and nationally recognized innovator and clinical educator. Page has been instrumental in the development and evaluation of innovative training programs for the next generation of family medicine physicians. With support from numerous federal, state, private and public sector funding sources, Page has overseen the development and launch of the Family Medicine Rural and Underserved Track in partnership with Piedmont Health Services. 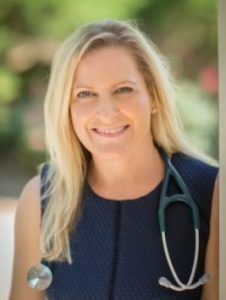 Additionally, Page is the creator and director of the FIRST Scholars program, a UNC School of Medicine initiative designed to accelerate and enhance the training of family physicians to serve our state’s underserved populations. The program recently announced its second cohort of students and is expanding to the Brody School of Medicine. Continuous innovation and improvement will remain Page’s priorities as Chair. “Of particular importance is our commitment to transform primary care to achieve the highest quality and patient experience at the lowest cost, while caring for the wellbeing of our providers and staff—the Quadruple Aim,” Page said. In the summer of 2016, UNC’s Family Medicine Center celebrated a grand re-opening after extensive process redesign and physical renovations. The result is a highly functional, national model for primary care. Page played a key role in the redesign. Since 2011, Page has directed the UNC Family Medicine Residency Program, which is top ranked nationally by U.S. News & World Report. Under her leadership, the residency program expanded its graduates by nearly 40 percent, created mobile technology to address new ACGME standards and achieved the highest possible ACGME accreditation status. A lifelong Tar Heel, Page came to UNC as a Morehead Scholar. She received both her MD and MPH from UNC. She completed her residency at UNC Hospitals, including a year as chief resident, before joining the family medicine faculty. “It is a privilege to serve alongside such talented colleagues – both in our department and in the larger healthcare system – as we work together to an even brighter future,” said Page.